Stephen Strasburg was sent to the minor leagues on Saturday by the Washington Nationals, who told baseball's top pitching prospect he needed to slow down his delivery from the stretch in order to speed up his arrival in the majors. 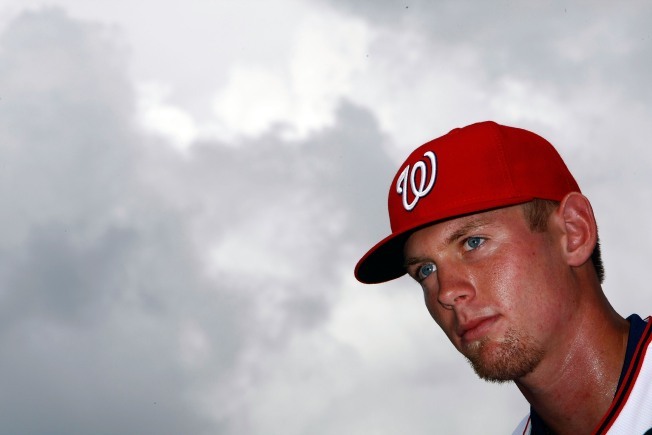 The Nationals optioned the 21-year-old Strasburg, the top overall pick in June's draft, to Double-A Harrisburg. Easily the best pitcher in spring training for Washington, Strasburg got the news when he reported to Space Coast Stadium the morning after his most impressive spring outing. He struck out eight St. Louis batters in four innings Friday night in his third spring start. Strasburg, who signed a record $15.1 million contract in August, allowed two first-inning home runs, then settled down and took command. Displaying a fastball that reached 98 mph and a slider-curve hybrid that hitters had trouble reading out of his hand, Strasburg went 1-0 with a 2.00 ERA, allowed eight hits, walked one and struck out 12 in nine innings. "What he did out there just verified what everybody had been saying. ... He did everything you wanted him to do. I don't think camp could have gone any better for him,'' manager Jim Riggleman said. making it easier for hitters to catch up to his fastball. Altoona. Rizzo wouldn't rule out summoning Strasburg to pitch April 3, when Washington hosts the Boston Red Sox in an exhibition game at Nationals Park. When Strasburg will make his big league debut remains to be seen. The Nationals led the majors with 103 losses last season. The Nationals' rotation is unsettled past left-hander John Lannan, the presumed opening day starter, and right-hander Jason Marquis, a free-agent acquisition. But keeping Strasburg in the minors until late May or early June could save the Nationals a sizable sum of money because it delays Strasburg's eligibility for salary arbitration and free agency. NOTES: RHP Drew Storen, the 10th overall selection in June's draft, was reassigned to the Nationals' minor league camp, along with C Jamie Burke and LHP Doug Slaten. LHP Matt Chico was optioned to Triple-A Syracuse. The moves leave Washington with 39 players in major league camp.